You love your C4 but you also want to get ripped as possible. What are the key differences between C4 and the new C4 Ripped? Will taking new C4 Ripped help you shed those couple of stubborn kilos you’ve been struggling to lose? But will you still get the same great pre workout boost from the new C4 Ripped? There’s a lot of overlap between C4 and C4 Ripped when it comes to common ingredients. However, the key difference lies in the C4® Ripped Blend. This blend takes the place of creatine nitrate in C4. Present at 1g per dose, some would argue that the omission of creatine nitrate from the new C4 Ripped will not make much of a difference to the products effectiveness. On the contrary, the addition of quality fat burners like l-carnitine, green coffee, Capsimax® and Coleus forskohlii make for an impressive upgrade for C4. As the comparison table below shows, C4 Ripped contains the same amount of active ingredients for each ingredient it shares in common with C4. Creatine nitrate is the only ingredient not found in C4 Ripped. In its place is the 1000mg proprietary C4® Ripped Blend; the composition of which is shown below. The C4 Ripped Blend contains an impressive array of actives, with each and every one having good evidence behind them for their fat burning effectiveness. However, the only issue is dosage. With all the ingredients making up a total of 1000mg, it probably won’t have the same potency as a standalone fat burner. But the average reasonable person buying a combo pre workout/fat burner is not going to expect such a unique product to be maximum potency given it’s basically a 2-in-1 supplement. The new C4 Ripped ticks all the boxes as far as taste, flavour and mixability are concerned. Once you crack open a tub, you immediately notice the quality of the fine powder that is very free-flowing and can be effortlessly mixed into water (a 2-second stir suffices). Lastly, although subjective, the taste is well rounded with a nice balance of sweetness and tartness. These sentiments are echoed with C4, as many users can attest - making it hard to separate the two on taste and flavour. 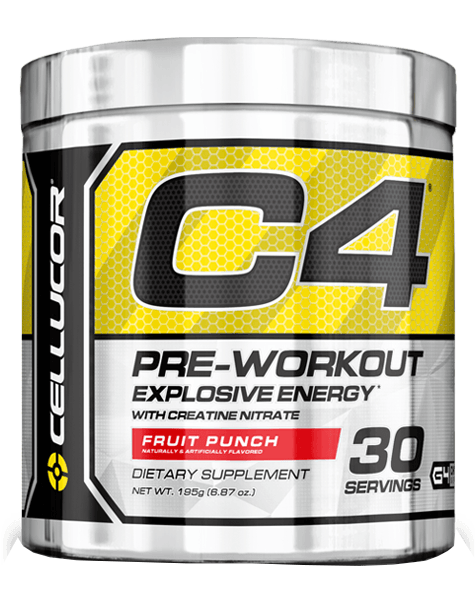 Compared with the six flavours offered for C4, C4 Ripped comes in just three, namely, Tropical Punch, Raspberry Lemonade and Cherry Limeade. The extra fat burner ingredients in C4 Ripped do come at a price. Despite being a 30 serve, C4 Ripped is more closely matched to the price of the C4 60-serve than the C4 30-serve. In one sense this is to be expected as the average Joe knows that a fat burner with quality ingredients like l-carnitine green coffee, Capsimax® and Coleus forskohlii doesn’t come cheap. Undoubtedly there will be individuals who are more price sensitive. The concept of Cellucor C4 Ripped is great and it’s sure to appeal to the legion of gym goers that love their fat burners and can’t do without their pre workout. Given that you only miss out on 1000mg of creatine nitrate when taking C4 Ripped, this makes it a pretty enticing offer over C4. But for the price sensitive customers, the higher price may be a little too much to sway them towards C4 Ripped. Whatever your inclination, both C4 and C4 Ripped are great quality workouts that won’t disappoint even your fussy pre workout customer.